My client purchased this charming cottage in Bethesda in 1998. After enjoying it for a few years, she turned it into rental property after making a cross-country move. When she decided it was time to sell, she brought me in to give the property a major facelift in order to maximize her profits and speed in selling. Although the house was in good shape, it definitely needed refreshing. So I went to work. 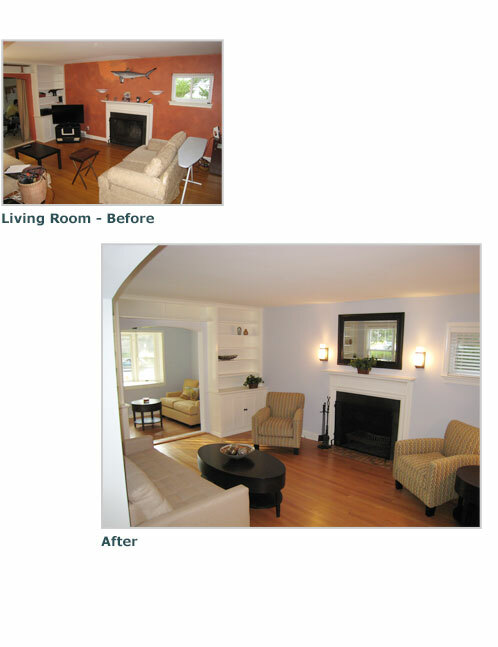 First I chose a light and airy interior paint palette that gave every room in the house a fresh, contemporary feel. I had all the old wall-to-wall carpet pulled up and the original wood floors refinished. Next I had new wood flooring installed in the front sitting room and replaced the old window treatments with attractive but affordable blinds. The unfinished basement became exponentially more appealing after I had it painted, then neatened up or eliminated the unsightly loose wires. The back porch was transformed from a utilitarian storage area into a relaxing outdoor refuge with the addition of new bead board, a ceiling fan and painted floor in a soothing shade of blue. The bathrooms were original—rather retro—and we agreed that the new buyer would either love them or hate them. So we left them intact, and simply cleaned them up and then decorated with up-to date accessories, towels and art. I updated the kitchen with affordable treatments like buffing the countertops to look like new and replacing the light fixture. Several other light fixtures and ceiling fans were replaced throughout the house as well. Next came new tile in the foyer and painting the front door an eye-catching shade of terracotta. That, combined with spruced up landscaping and some additional staging gave the cottage the attention-grabbing curb appeal that buyers gravitate to. The result? The house sold in 3 days for a full cash offer. Needless to say…my client was thrilled!